Audiobooks have so many benefits! Do you know them all? I bought my first audiobook in August 2014 when Neil Gaiman posted that the BBC full cast production of Neverwhere was available on Audible.com. I’m walking up and down our hall. We have a fairly small apartment: living room, bedroom, daughter’s room, kitchen, bathroom, all pretty small. So, I’m slowly walking through the dark hall, around the corner into the dark bedroom, turn around, walk back along the hall, into the living room, turn around, back to the bedroom. Daughter dearest is 17 months old and she’s getting her molars. Since last week she has not slept before 10pm a single day because teething is nasty. She’s in pain. She’s a tough cookie and doesn’t cry. But she also can’t sleep. Tonight, once again, breastfeeding and singing and cuddling couldn’t lure her into magical sleepy land. So I put her on my back in the emeibaby carrier and start walking around the apartment. Before the molar teething got so bad I’d sometimes take 1 or 2 hours of alone-time in the evenings. Whenever I wasn’t too tired and would just fall asleep alongside her. As an introvert, I desperately need that me-time to unwind. Now, though, I have my trusted Bluetooth earpiece in my ear. Instead of watching Jessica Jones on Netflix I’m listening to the adventures of Sam the Imp , while walking slowly up and down to help my wonderful child fall asleep through aching gums, growing pains and development spurts. 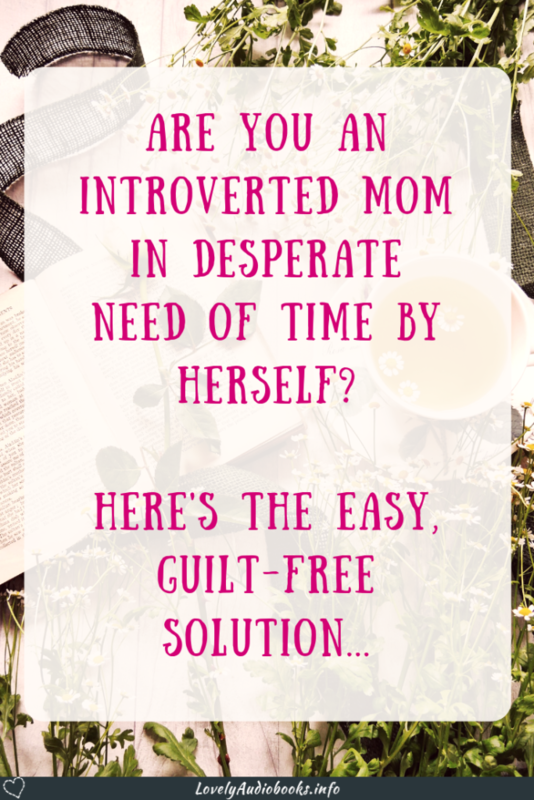 Between playing with the little girl, cooking, doing laundry, tidying up toys, and – oh right – working, I have found a niche for guilt-free alone time that doesn’t take anything away from my baby. There’s Me-Time DeLuxe, when one of the grandparents comes to visit or daddy has a day off and takes the little girl for a long walk or a playground visit. But that’s just not enough for the sensitive introverted soul. I desperately need my daily alone-time to recharge. If I interact with other people all day I end up feeling completely drained and exhausted. For introverts it’s very important to make time to gather their thoughts and just be alone with themselves. If you aren’t aware of it and/or just ignore this need, a burn-out is waiting just around the corner! In the first year after birth I had more time to myself, because the little girl would sleep much more. And it was absolute bliss for her and me when I put her in the baby carrier. I didn’t have to use as much energy to check on her, because I could just feel her against me. And she’d enjoy all the many up-sides of being a carried baby (click here to read about it on Wikipedia). When she became more active, started to walk more and sleep less, I was very exhausted – like pretty much all parents. I felt I had to consciously create a niche for my introverted side. This isn’t easy when you’re a working parent. Between work, cooking and keeping your house remotely clean-ish, there are simply not enough hours in a day for spending time by yourself and spending quality time with your child, while still getting enough sleep, too. There’s only one solution: Two things at the same time! So I made my Daily Me-Time. Packing the dishwasher while the hot alpha millionaire tells the nerdy Amazonian woman that he can’t live without her anymore . Folding laundry while she kisses him for the first time. Cleaning the bathroom while the Queen of Hel (no typo) flirts with an Archangel . Through book-ish magic, audiobooks have brought the me-time and the wonder that are books back into my daily life. Put on those headphones and your chores or your commute turn into quality time for yourself. I’ve heard that a few times from fellow readers. The main issue is usually that they can’t focus on the audiobook. I’ve experienced that a few times, too. I just couldn’t focus on an audiobook. But I can tell you, it’s either because the story doesn’t work for you or the narration isn’t captivating enough. If you want to get into audiobooks, this is the best way: Pick a few books you really love and want to re-read, go to Audible (I’d love if you used my link below for that, it supports my blog but doesn’t cost you anything extra) and search for those books. If there is an audio version, check the Sample by clicking on the arrow below the cover image. Choose one with a voice you really like. Alternatively, if you aren’t a re-reader, look for new books from authors you know and enjoy very much. Just make sure you find a story that will really work for you and where you have more to go by than an interesting blurb. Pick something that you’d immediately read if it were a book. Then check those voice samples! I recently read a quote about how you can fall in love with a voice. It’s true! Find a narrator whose voice you love and who makes the story come to life. If you keep those two points in mind, I’m sure you’ll find an audiobook that is worth it and that you will love to listen to. Just don’t accidentally throw the red socks in with the white laundry because you got too distracted by your exciting new story! Don’t forget, audiobooks can give you back considerable amounts of reading time you had to give up before. Please follow or subscribe to Lovely Audiobooks and stay tuned for more upsides of audiobooks. 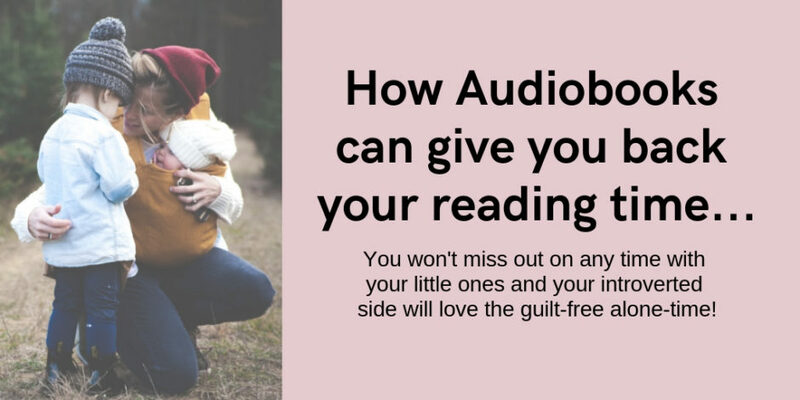 Now you know how, thanks to audiobooks, introverted parents can get guilt-free alone time. Read on to find out how old audiobooks really are and why they matter so much; How they can calm your mind and help you sleep; And how Romance audiobooks can be very educational. Check out my Audiobook Guide right away to get the best deals on high-quality Audible books. 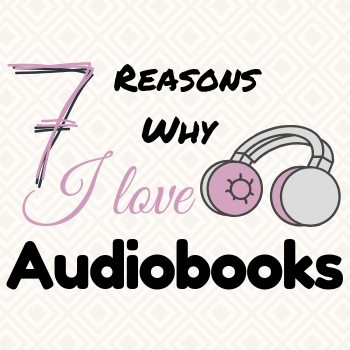 Are there other reasons why you don’t listen to audiobooks? Share your concerns in the comments below and I will look for a solution! Are you already addicted? Share what audiobooks do for you in the comments below!